Doing your favorite activity with visual limitations can be frustrating, even more so if you are an athlete. An athlete’s vision is one of the most important tools for their performance. However, athletes with eye disorders usually need glasses or lenses to actively participate on the field or court. Depending on your prescription, playing without glasses could significantly decrease your ability to perform your best, and playing with them on causes distractions and a potentially expensive drop! Contact lenses become an annoyance, too, with the addition of dirt and sweat. While glasses and contact lenses have been the safest choice for years, they have been proven ineffective and inconvenient for athletes overtime. Now, athletes have sought after new ways to improve their vision. Though LASIK has been around for years and proves to be the best solution to chronic eye disorders, many active patients still have reservations about it. In general, athletes are qualified to undergo LASIK surgery because of their fast-paced, active lifestyle. However, the specific sport one plays has significance weight in eligibility. Most doctors warn their clients about the complications after getting LASIK because contact sports will always have a higher risk of eye injury. These patients must also be willing to take downtime from playing their sport post-surgery to allow for ample recovery time. This recovery period varies patient to patient, with some patients needing just 2 days while others need 2 weeks. Still, the interruption could be seen as a deal-breaker by some, specifically by athletes who train year-round. As stated, the degree of risk in LASIK surgery depends on what type of sport an athlete plays. Some are at higher risk if they play contact sports including basketball, wrestling or boxing. Athletes who play non- or low-contact sports like baseball or tennis are at a much lower risk. The main concern of LASIK is the healing of the corneal flap that is created during surgery. If the eyes were to be injured while the eye is not fully healed, it can cause corneal re-opening, leading to potentially serious damage. Accumulation of sweat and dirt during play can also lead to irritation, causing infection that could hinder the eye’s healing process. There will be certain precautions in having LASIK Surgery. The most important part in having a successful surgery is the healing process which includes protecting the eyes. Most doctors would recommend athletes in minimizing their strenuous activities for a reasonable amount of time after undergoing LASIK. A limited amount of training is usually allowed in the early healing process but also varies with the sport and the actual procedure that was performed. Following of the doctor’s instruction for post-op LASIK care can really prevent and avoid the complications of LASIK. The doctor would usually order you to rest for a week or two, restrict your training and competition, but the benefits that you will reap can be enjoyed for a lifetime. 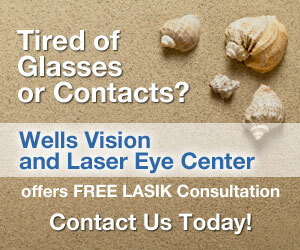 Wells Vision in Destin, Florida is considered one of the top choices to undergo LASIK surgery. Many professional athletes have been benefiting from the positive results of LASIK since it was introduced more than 25 years ago. No need to buy glasses or contact lenses. Play hassle-free for a lifetime. If you still have doubts about LASIK eye surgery, ask our trusted doctors and surgeons here at Wells Vision and Laser Eye Center in Destin, Florida. Avail from our comprehensive eye exams and services. Lead your athletic life worry-free and always keep your game face on.